Coach, Friend, Hero, Guide...a brother plays multiple roles in life and makes your life wonderful in a thousand ways. How about treating him in the most special way possible? Send Rakhi to Aligarh along with love-filled hampers and give him a gift of smile. Aligarh is one of the largest cities in Uttar Pradesh. It is a city comprised of diversity, culture, festivals, and everything that is traditional. The people of Aligarh believes in celebrating each and every festival with full joy and rituals. From Holi to Diwali to Eid to Raksha Bandhan, Aligarh gives home to people from all cultures and traditions. Talking about Raksha Bandhan, the sacred festival of sibling is widely celebrated in Aligarh with utmost enthusiasm. Therefore, to infuse more happiness in this celebration of the pious bond shared between brothers and sisters, FlowerAura brings to you its online rakhi delivery in Aligarh. Now, you don’t have to go outside to the market to do your rakhi shopping as you can now place a rakhi online order in Aligarh from FlowerAura comfortably seated at your home. Well, if you are pondering over whether you will get an extensive range of rakhi at FlowerAura or not then, let us tell you that we offer a wide variety of gorgeous rakhi online in Bareilly that are designed with utmost perfection. Whether you are looking for a traditional rakhi like zardosi or a spiritual rakhi like swastik, you can find every type of rakhi for every type of brother available at our online store. The celebration of Raksha Bandhan becomes more memorable in the presence of siblings.But, if you stay far away from the city and your brother resides in Aligarh then you must be a little sad as you cannot celebrate the festival with fervor. Right? But, to add a huge smile on your and your brother’s face, Flowerura’s has taken the charge. Now, you can send rakhi to Aligarh for your brother on Raksha Bandhan and make him feel loved. With the aid of FlowerAura’s rakhi delivery in Aligarh, now you can send your best wishes to your brother on the occasion of Raksha Bandhan. Floweraura believes in spreading sibling love all over. This Raksha Bandhan, make your sibling love even stronger with our meaningful range of rakhi and rakhi gifts online. 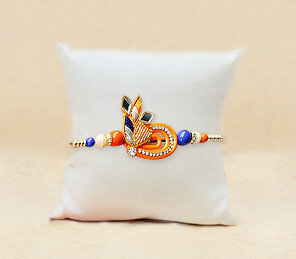 Yes, not just rakhi threads but we also offer an amazing range of rakhi gifts for both brothers and sisters. So don’t just let this sibling festival go dull. Send online rakhi to Aligarh along with the best rakhi gift for your brother via our express delivery services. In case, you are unable to send a rakhi for your brother in Aligarh a day before the occasion, you can avail our same day rakhi delivery services and also enjoy free shipping. Yes, now with the aid of our same day rakhi delivery in Aligarh, you can send a rakhi for your brother on the same day. So, be it a rakhi or a rakhi gift, FlowerAura assures you to get your love delivered to your brother on time without any hassle.